A weapon manufacturer wants to modernise a shooting tunnel in order to measure the muzzle ­velocity of machine guns. During the test single shots and salvoes are fired off. The bullets pass two light barriers which measure their velocity. The time the bullet needs between the two light barriers is counted and the speed is calculated. 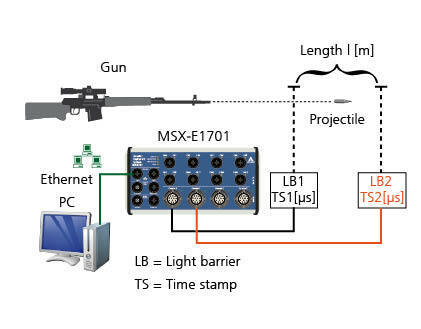 The system has to be precise enough to be able to measure times from 500 µs to 10 ms.